This guide will run through all the functionality of the timesheet vs roster page. This page is designed so the timesheet can be quickly compared to the roster and amendments quickly made. The data is listed employee by employee. The page does this by overlapping the roster and the timesheet. Another way to look at the legend is red will cost the business more and green will cost the business less, if wages are calculated from timesheet data. The i column illustrate how the shift was created. 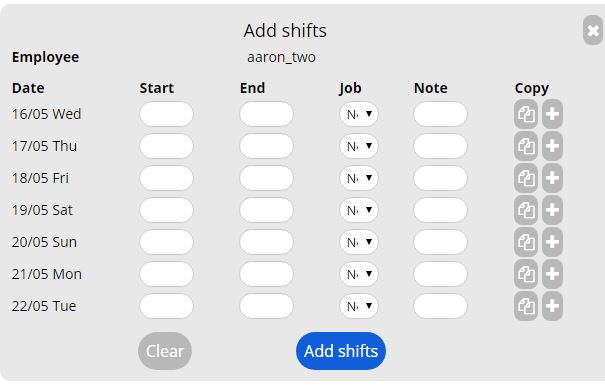 You can add multiple shifts for an employee over a week. Select the employee from the Search bar at the top of the page. Enter the Start, End and Note values that correspond with the missing timesheet entries. 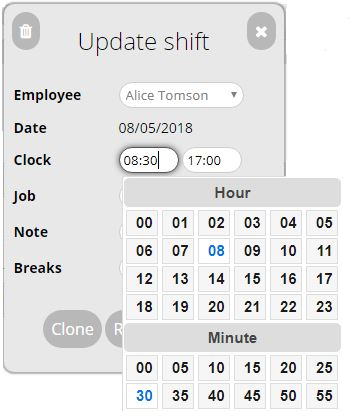 Can add split shift by clicking the plus button next to the corresponding day. 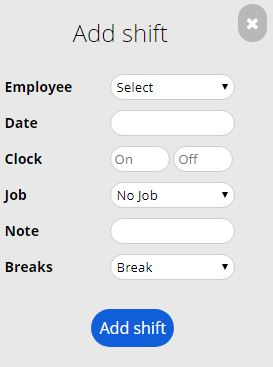 Once finished click Add Shifts, and they will be added to the employee's timesheet. Click on the shift's date, time, creation method or job and a form will appear that will allow you to make changes. The roster is rarely going to match the timesheet perfectly. Every business will find different trends from the information on this page. The above illustration is an example of an employee who has clocked his work hours exactly the same as his roster. Under all circumstances this is what you should be aiming for from every employee and from realistic planing. The above example is of an employee who clocked on late every morning. You can use this information to identify possible issues. The employee in the above example worked back late on one of their shifts. Employees will miss shifts and other employees will fill in for them. The above example illustrates that Jason Bourne missed his shift on the 2nd (Green roster). He may have forgotten to clock his hours. If this was the case we could click the Create button and add his shift. However, in this case, he called in sick and James Smith filled in for him. We can easily spot the shift that James worked that he was not rostered on for (Red shift entry). There are many reasons why the hours clocked don't match the hours rostered.